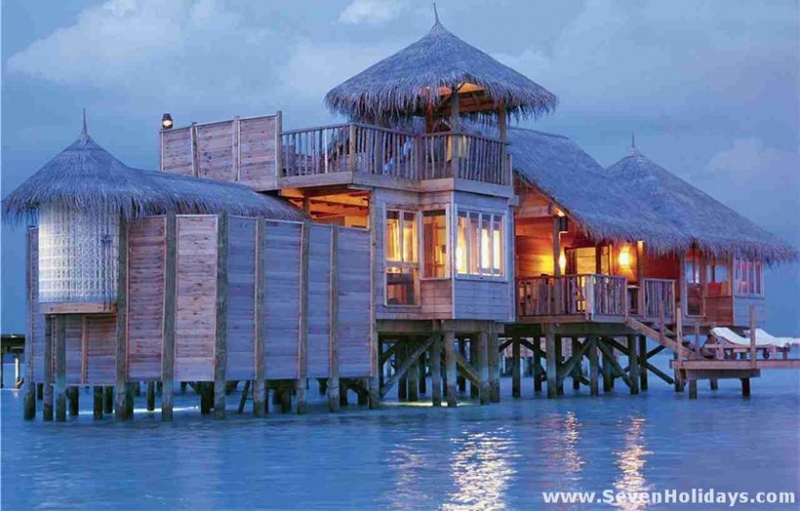 For putting your mind at ease and raising your spirits there is no resort in Maldives, and few in the world I would guess, better than Gili Lankanfushi. 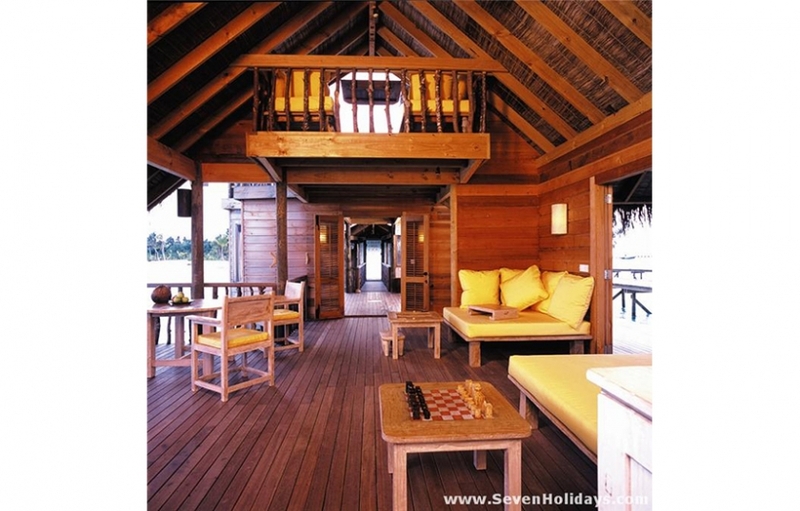 The HPL group from Singapore took over Soneva Gili last year. 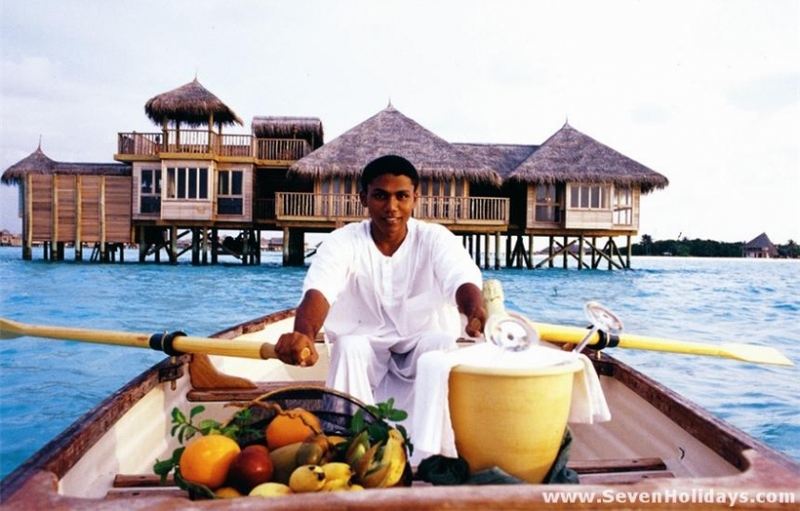 An early decision was to take 200 items off the “No No list” that defines the Soneva concept. For example there are now lobsters being served, cigars are available and live music is played on some evenings in the main restaurant/bar. These are just the changes required for a rich clientele used to getting their wishes and desires. Nonetheless, one can still tell that this dream resort was created by the brilliant British Indian and Swedish couple. 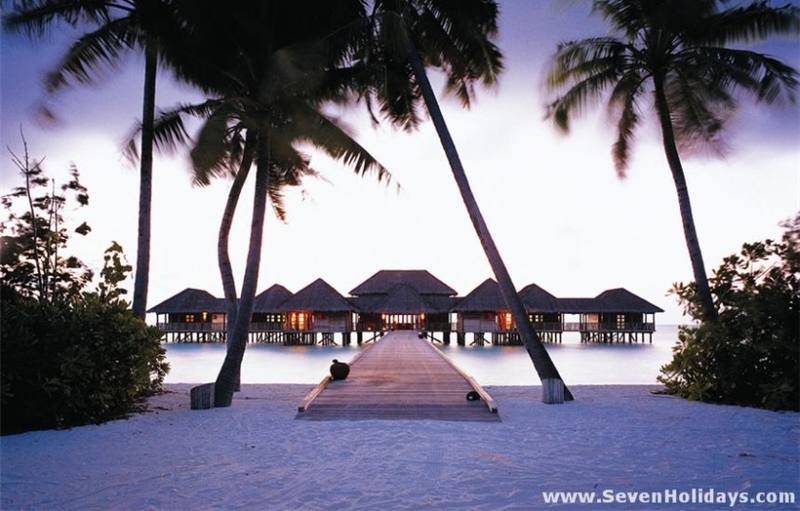 Many other resorts are superior in some key aspects of a Maldives holiday , but the lack of distractions, visually and mentally, combined with mould-breaking design and fine cuisine make this place something like a sanctuary for the senses. 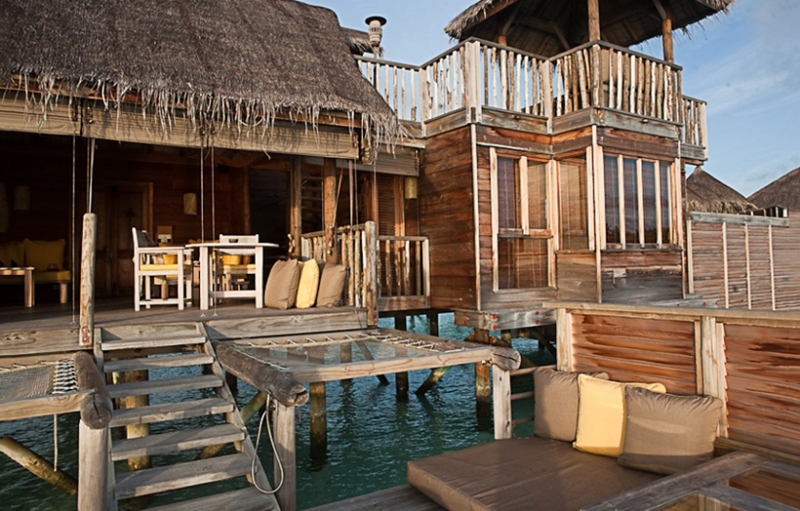 In startling contrast to the norm, Gili Lankanfushi’s 45 waterbungalows are a series of rooms, decks, landings and rooftops that seem to emerge from each other. Some spaces are under thatch, some under open sky, some open to the water below and some can be enclosed for air conditioning. The wooden boards and pillars are unadorned, the thatch is not concealed, the wooden furniture is handmade, the cotton covers are in single earthy or sunny colours. 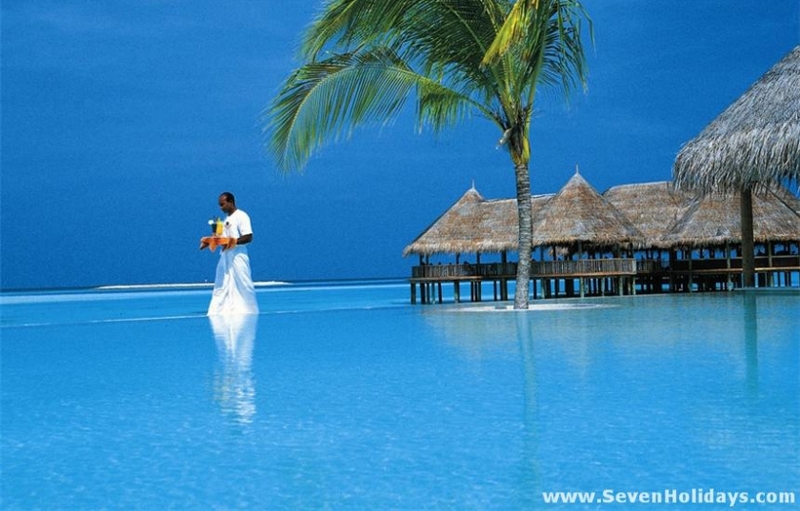 At the same time, every luxury of an exclusive resort is incorporated. This is rustic chic: a rustic that takes you back to a simpler time, a chic that delivers modern. The 29 Gili Villa Suites line 3 jetties. The 8 Gili Residences at the end of the jetties are a little bigger and have better views. The 7 Gili Crusoe Residences are the same as the latter except they are cut adrift in the lagoon and enjoy completely clear views to the horizon. 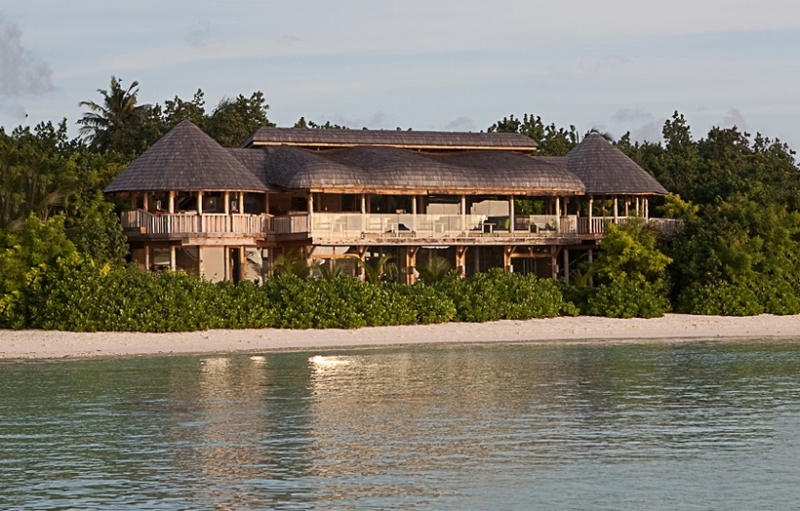 There is also a Gili Private Reserve, which has 5 separate buildings and is 6 times the size of the Residences. It would come alive with 2 full families (there’s a terrific waterslide). Nearly all the residences and a few of the villa suites have uninterrupted views to the horizon, filled only with shades of blue and turquoise (and the white of drifting clouds). 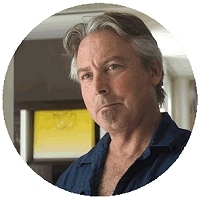 The ocean rumble, the breaking waves on the reef and the ripples around the room are sounds that reach deep inside. Soundtracks on the entertainment system include whale calls and birdsong. But even with a driving rock number playing, the whole place is so friendly and personal you feel you really should be naked. 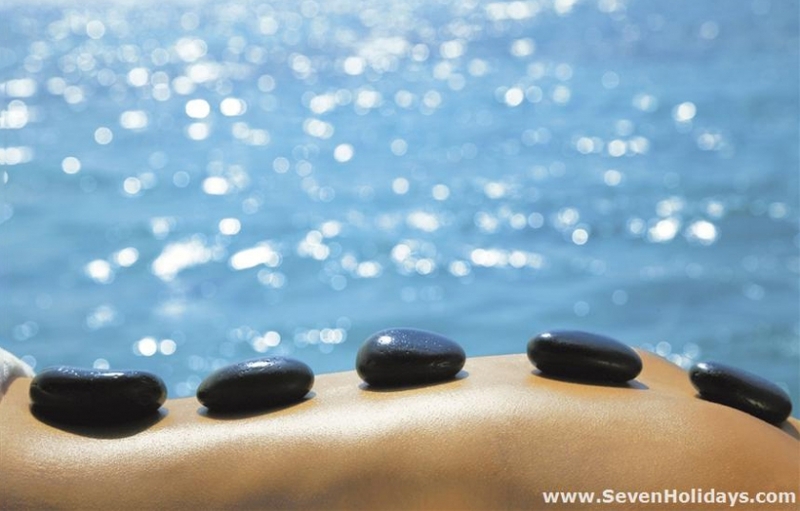 The over-water spa “Meera” ( “ocean” in Sanskrit ) is delightful, calm and serious. The complex includes a gym, a steam/sauna and a relaxation room on the first floor. Nearby, on the shore, hidden between vegetation and a thatched roof is a yoga and Tai Chi champa, which offers spiritual early mornings or evening sessions. The spa boutique features beautiful sarongs and jewellery and an exclusive selection of products from Voya Organics and Sodashi, a seaweed based range, also used with most of the treatments. There are no straight lines on this island. The buildings are rounded with stucco-style finishes. Nature’s materials are used and left unrefined. Gili Lankanfushi works hard to imitate nature, right down to the details (mugs are dimpled, saucers scalloped). It never feels pretentious but rather it all helps to lift your mind out of the straight (and narrow). Dining experiences here were always very good, now they are often sublime. A new restaurant lifted above the shoreline vegetation has a delightful nighttime ambience and marvelous Japanese cuisine. In the cool cellar, wine tasting and wine dinners are hosted by the sommelieror, occasionally, visiting wine growers and renowned chefs. 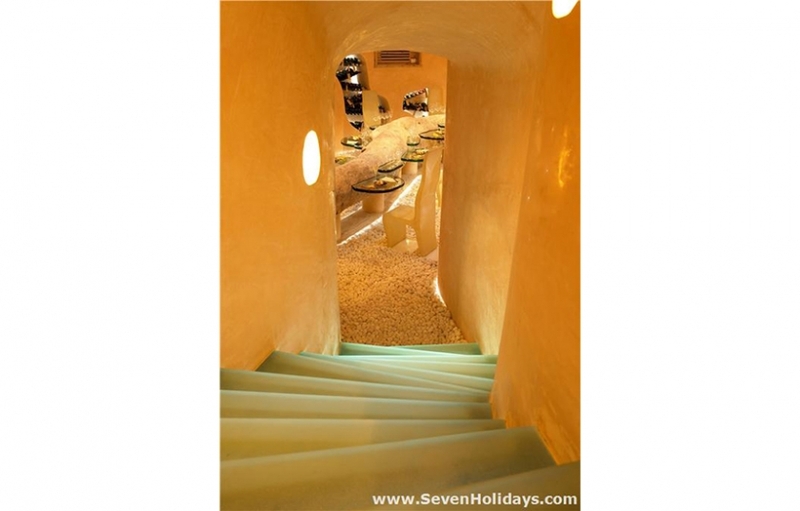 Also in the cellar is a splendid charcuterie and cheese store. The bar and restaurant over the lagoon offers personal stir-fry lunches: you select ingredients, which are arranged as a presentation plate and served at table. 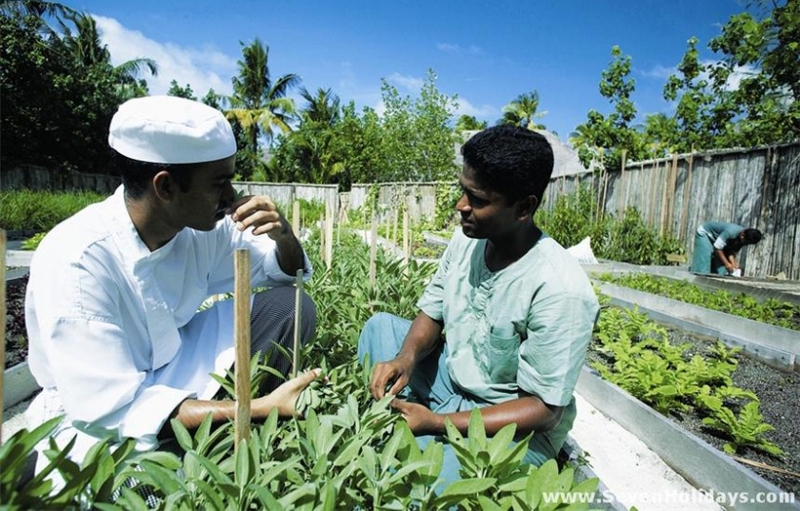 Healthy food and fresh produce from the resort’s own garden are prominent. The main island restaurant serves a deluxe variety of cuisines for breakfast and dinner, with in-villa dining at no extra charge, if you wish privacy. Little touches of playfulness appear, such as the 2 mattresses under thatch in the middle of the pool, and a hammock strung between branches in the lagoon. New in the lagoon is a fun swim-up bar. It’s a bit of a swim from the beach but easily reached by canoe or pontoon boat. The snorkeling is not much to write home about, nor is the beach. 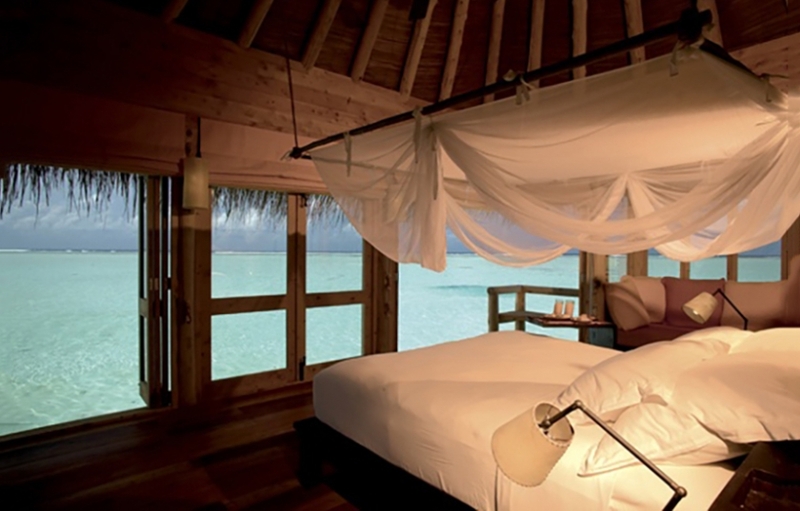 The lagoon is shallow (the west side rooms, facing the lagoon rather than ocean side that have deeper water). But there is some good water wild life to be seen at the end of jetty three because of the deep channelbetween Paradise and Lankanfushi island. Two snorkeling trips per day on a very comfortableDhoni take you to nearby reefs for supervised snorkeling fun. There are no great inhabited or uninhabited islands nearby. These are significant downsides, yet I would rather holiday here than just about anywhere else, especially for a romantic getaway but also just to escape urban life, feel free again and be wildly pampered. The following is probably a common occurrence but I overheard it here: a couple were booking an excursion, they turned, stared at each other and then started laughing. They had both completely forgotten what day or date it was.